Wsky 2019 LCD LED 2800 Lumens Portable Home Theater Video Projector is currently selling at $129.99, which is its normal price. It has a lowest price of $129.99 and is selling within its usual range. Price volatility is 0.15% (meaning it does not change often), so you might have to wait a while for the price to drop. Until then this is a recommended 'ok deal'. The current deal is also the best price on this item over the last month. 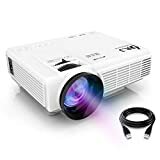 Compare the current price, savings (in dollars & percent) and Buy Ratings for the top Portable Projectors that are closely related to Wsky 2019 LCD LED 2800 Lumens Portable Home Theater Video Projector. Here is how Wsky 2019 LCD LED 2800 Lumens Portable Home Theater Video Projector compares with other leading Portable Projectors. Authentic Big Screen Home Theater Wsky Direct 2019 Upgrade Projector, Projection Image Capability is up to 176 inches, 20% larger than our 2018 model. The light is 90% brighter than regular projector. Dolby Speaker and Dual Fan Cooling System Dolby Audio technology is a powerful set of technologies for providing rich, clear and breathtaking sound effects for home theater. The technology can further enhance the appeal of entertainment by providing a dynamic auditory experience. Dual Fan design, Cooling system is more efficient, which protects the light bulb and makes the lifespan longer, up to 40000 hours. Easy to Set Up and Adjust You could choose Rear, front, ceiling, three ways to make projection, with a screw holes under projector(screw is not included) for ceiling mounted, operate with remote control or manually. Support ±15°vertical keystone adjustment. Multimedia Interfaces Enhance Your Entertainment PC, Laptop, PS4, Xbox One, Xbox One X, TV BOX, USB Driver, HDMI device, VGA, SD etc. Enjoy gaming and TV shows through Big screen. Never worried about the subtitle too small. If you want to connect to iPhone or iPad, please purchase additional MHL cord. Specifications Aspect Ratio: 16:9/4:3 Contrast Ratio: 2000:1 Projection Distance: 1.0~5.5m Screen: 30~176 inches, depending on the distance Lamp life: 40000 plus hours TF Card: Maximum supported 32G HDMI: HDMI input Package 1 x Wsky 2019 Newest Upgraded Projector 1 x Remote Controller 1 x Power Adapter 1 x HDMI Cable 1 x AV Cable 1 x User Manual Note:If you find anything missing in the package, or anything wrong with our projector, please contact our customer services, we will reply you within 12 hours and help you solve the problem out. Features?ENHANCED MATERIAL AND IMPROVED CONTRAST: Wsky Direct 2019 newest projector adopted innovative design. The new appearance is more fashion and simple than the old model. Improved contrast rate of 2000:1 and enhanced LED technology make the projector 90% clearer and brighter than the most regular projector, perfect for movie night backyard or family reunion entertainment in dark. We DO NOT recommend for PPT, Word, Excel or business presentation. ?ULTIMATE VIEWING EXPERIENCE: Cinema-level bigscreen display 16:9, support HD 1080P. Support ±15°vertical keystone adjustment, so you can enjoy movies, games and music video on 30~176 inches BIG screen! (Recommand use it in the dark environment. )?DUAL FAN DESIGN AND POWER SPEAKERS: Dolby Speaker provides a dynamic auditory experience for playing movies. Dual Fan design with noise suppression technology, largely reduce fan sound. The projector is equipped with an innovative cooling system with heat dispersion, which protects the light bulb and makes the lifespan longer. 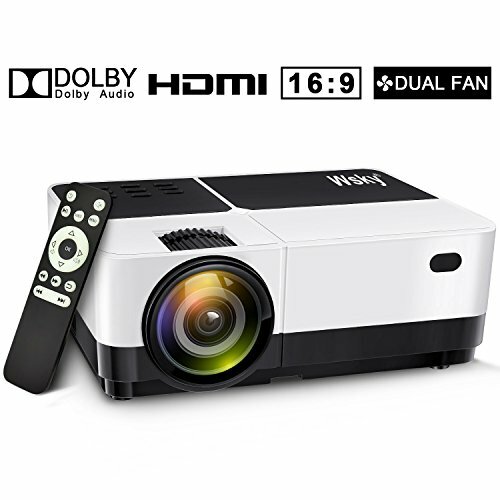 ?MULTIMEDIA CONNECTION AND SUPPORT: Wsky Direct video Projector enable to connect to game boxes like PS4/PS4 PRO/Xbox One/Xbox One X and PC/Outer Speaker/U-disk/Hard disk via multiple input interfaces, such as HDMI input/VGA jack/Audio port/USB slot. Use MHL cord or HDMI to USB cable, you could also connect it to your iPad and iPhone.